By Suzanne | February 8, 2013. Ghosts of Liberties’ past haunt historical sites in the neighborhood, some locals say. As Brendan Browne and his construction crew work long into the night at Archbishop Marsh’s Library, they may not be alone. “One of the guys went to lock the door, and all of a sudden, our lights went out. When our electrician went to turn on the lights, he looked back and saw a little girl in a white lace dress walking past,” said Browne. 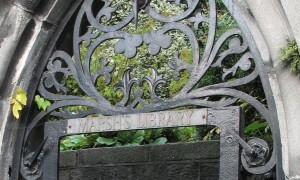 Marsh’s Library, Dublin’s first public library when it was founded in 1701, has a 25,000-book collection – and stories of betrayal. Narcissus Marsh lived here in the 18th century with his beloved 19-year-old niece Grace. Legend has it that Grace and a clergyman became romantically involved, but he was not accepted by Marsh or the rest of her family. So the couple decided to secretly elope; before running away, Grace left a note for her uncle giving him her deepest apology in one of the library books. It is said that to this day, broken-hearted Marsh roams the library at night in search of the letter. A very hesitant to believe bookkeeper of the library, Sue Hemmens, says she has never witnessed anything out of the ordinary during her daytime shift. Still, Hemmens admits to a noticeably colder second gallery. She said the gust of wind, which some believe to be the Marsh’s spirit, gives visitors the shivers. There are other sites in the old Liberties area some suspect are haunted. Thrill seekers can take a tour with Dublin Hidden Walks that takes them on a bus from one haunted place to the next throughout Dublin. The tour ends with a well-deserved drink at The Brazen Head pub, which has a haunted past of its own. “Robert Emmet lived here in The Brazen Head for over three years,” said John Hoyne, as he filled a pint of Guinness for a customer. Hoyne, The Brazen Head’s owner, said his pub is Ireland’s oldest, dating back to 1198. The historical inn, restaurant and pub still has eight of the original bedrooms. Although no one reports seeing Emmet’s ghost in the 10 years that Hoyne has been owner, he has seen strange things. Hoyne said he throws salt over his shoulder whenever it spills and never walks under a ladder, just in case. “I’d be more scared of the living before I was scared of the dead anyway,” Hemmens said with a smile. Patricia Boscán was part of a team of students from Columbia College Chicago who traveled to Ireland to report and write about the Liberties.